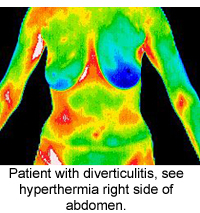 With the advances in modern computer technology, healthcare providers and their patients now have economically viable access to a diagnostic modality known as Thermography or Digital Infrared Thermal Imaging (DITI). Digital Infrared Thermal Imaging is a non-invasive diagnostic test of physiology that has been evolving over the past 20 years. The early systems bear little resemblance to the Digital Infrared Thermal Imaging systems being used today. The systems can be used in most clinics and tests take about 15 – 30 minutes. Digital Infrared Thermal Imaging is being increasingly recognized as a useful tool in the early identification of musculoskeletal and neurological injuries, especially non-specific (and difficult to diagnose) pain syndromes. The ability to detect inflammatory and neurological processes at a very early stage can be critical to the outcome. Digital Infrared Thermal Imaging can provide information about a patient’s response to treatment as well as the effects of injury, disease or prescribed treatment. Digital Infrared Thermal Imaging is unique in its capability to show physiological (functional) abnormalities and can graphically display and record the patients ‘subjective’ feeling of pain by objectively displaying the changes in skin surface temperature that accompany pain states. Digital Infrared Thermal Imaging is used to look for far more than just “hot spots”. With accuracy down to 0.1°c very accurate and objective results are possible. Nerve damage or irritation will be seen as areas of reduced temperature (cold). More commonly seen are patterns of heat caused by trauma or infection. 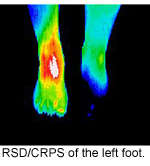 Even deep inflammation can be detected by Thermography. up to 2 weeks earlier than by routine clinical examination”. Other areas of use include musculoskeletal medicine, Physiotherapy, Chiropractic, Neurology, Rheumatology, and Dentistry. In sports medicine, Thermography is useful as a regular screening test to prevent serious injury and to allow training programs to be amended before irreparable damage is done. Such early detection and treatment could significantly reduce the financial losses associated with training delays and prolonged recovery time. Meditherm Limited can provide DITI equipment and also have their own clinic offering Thermal Imaging. PLEASE NOTE:Meditherm no longer offers thermography services.